* For vegetable shares we anticipate having organic: shelling peas, beets with their tasty young greens, escarole, lettuce heads, green onions, garlic scapes, Swiss chard, and our organic frozen orange juice. *Due to the large number of greens you’ll be receiving for the rest of CSA, we really recommend investing in a good salad spinner if you don’t have one! *Escarole is a leafy green that looks similar to romaine. It’s best cooked. We like to saute it in a little olive oil, along with some garlic scapes for a delicious side dish. It’s also wonderful added to soup during the last couple minutes of cooking, just give it a rough chop first. We’ll be posting a couple recipes on our Instagram and Facebook pages later this week, so follow along if you’re interested! *Beets with their greens are such a treat! We enjoy pickled beets immensely, but beets are also delicious steamed (just steam with their skins on, and the skins peel off really easily after steaming), cubed and tossed in olive oil and roasted (peel first), or sautéed. To saute beets, trim off ends, peel, and slice into 1/8 inch thin slices. Add a couple tablespoons olive oil to a frying pan, lay the sliced beets flat with a few pinches of salt, and cover the pan with a lid to allow for some steam build up. Cook over medium low heat until beets are almost tender, flip and finish cooking until easily pierced with a fork. So easy! Beet greens can be enjoyed simply by roughly chopping the greens, and chopping the ribs/stems a bit smaller. Saute the ribs first along with a few sliced spring onion bulbs, and once they’re tender, toss in the greens for another couple minutes over medium heat. * It certainly has been very dry, but rain is predicted for later today. With that in mind, if you would like to, you can pick your peas today (Monday June 18), as well as strawberries if you are planning on picking this week. See below for more info on u-pick. * PYO shelling peas are just starting, and there is no hurry for you to pick, as there are lots of varieties coming over the next couple weeks. However, if you would like to, you may pick up to an 8 quart basket of these first peas. Ask at the stand for directions. Usually we do not start PYO in the earliest varieties, but they are doing so well we thought you might want to start shelling early this year! Children are welcome to pick, if supervised by an adult. Please be careful to hold the pea plant with one hand, while you pull off the mature peas, to prevent the plants from being uprooted. Thank you! *Naomi will have more organically fed, whole, fresh (chilled, not frozen) chickens for sale at Tuesday’s pickup from 3:30-6:30, for $4/lb. Please bring a cooler if you plan on purchasing any. *U-pick strawberries will be open this week for everyone, including fruit share members. Please check our website to see when the field will be open, as weather/picking conditions can force us to change plans. We update the strawberry page every morning before 8 a.m.
* The strawberries are loaded today (Monday, June 18), and as much needed rain is predicted for later this evening, and that can possibly turn some ripe berries soft, you may pick your share today if you want. The field will be open until 6 pm. The fruit share this week is the same as last week, (6 quarts u-pick or 3 quarts already picked). If you choose to pick more than 6 quarts, the price per lb. is $2.10. * If you are choosing to pick today, the picking is in the lower field behind the stand, and Lisa will be there to direct you. Please ask for directions to the field at the stand, as this is a different field than last week’s! You may also pick up your orange juice while you are here today if you only have a fruit share and not a vegetable share you are coming later for. * We have been enjoying our orange juice mixed with equal parts of ice cold ginger Kombucha or natural type ginger ale to add some “fizz”. Watch out....it’s addicting! Method: Trim the ends of the garlic scapes to remove the small bulb and wispy top. Place scapes, herbs, nuts/seeds, parmesan, and lemon juice in the bowl of a food processor. Process until scapes and nuts are finely chopped. With the food processor running, drizzle in the olive over the course of about 20 seconds. Taste for salt. If you’d like to freeze this, scoop it into freezer safe containers, drizzle an extra tablespoon of oil on top, and freeze! The oil on top will help preserve freshness and color. You can freeze the pesto in oiled ice cube trays, and once frozen solid, pop them into a freezer container. Pesto is delicious with pasta, added to tomato soup, spread on top of salmon or chicken before roasting, spread on toast… basically anything! Whether you’re a returning CSA member, or this is your first year, thank you for joining our farm. We are looking forward to the next 21 weeks of fruit and veggie share pickups, which start this week on Tuesday June 12, or Thursday June 14, depending on which day you chose. Please bring coolers and tote bags to carry your produce home with. Pickups will be from 3:30-6:30 p.m., Tuesdays and Thursdays, for the entire season. Please, no early birds or late comers! If you can’t make your scheduled pick up day, let us know and we can move you from a Tuesday to a Thursday, or vice versa. We ask that you do your best to stick with your regular pick up day, and only switch if you absolutely must. If you can’t come out at all, you may send a friend or family member to pick up your share. Shares can be boxed up for pick up on a non-CSA day, for a $5 fee. Fruit shares will be available for pickup at the stand, and veggie shares will be under the green and white tent. Please be sure to sign in! We kindly ask that you leave pets at home. The farm store will be open with lots of baked goods (bread, pies, cookies, muffins, shortcakes etc. ), as well as extra produce, eggs, beef, pork, honey, maple syrup, and dry goods. Our farm store is open to everyone, regardless of CSA membership. Naomi will have fresh, organic chickens available for purchase on Thursday, June 14, as well as Tuesday, June 19. They are $4/lb., if you’d like to purchase any bring a cooler with ice! Feel free to visit with any of the farm animals, we have baby cows, chickens, ducks, and horses, all within walking distance of the farm store/CSA tent. We ask that children are supervised when viewing the animals, and please do not feed anything to any of the farm animals. Thank you! Strawberry u-pick will be open to the general public by this weekend at the latest, maybe sooner please check our website for daily updates and pricing. http://www.thorpesorganicfamilyfarm.com/strawberry-info See below for u-pick info for fruit share members. In the meantime, we should have already picked strawberries for sale on CSA days. $6/quart, $5.50/ qt for 3+ quarts, or $40/flat of 8 quarts. Jam berries are $4/quart. *Garlic scapes are tendrils that grow from the top of immature garlic plants. We cut them, which allows the garlic to focus more energy towards growing bigger cloves, and the scapes are delicious! They’re delicious sautéed in a little butter or olive oil, just give them a rough chop first. The flavor is a bit more mild than mature garlic cloves. They also make fabulous pesto. *Green onions are a mild, spring treat from onions over-wintered in the ground. You can use the bulb like you would any onion, and finely chop the green tops to use like you would use scallions. Or, save the tops of the green onions for a batch of homemade chicken or veggie stock. Method: Simply combine lettuce and spinach, sliced strawberries, asparagus is using, and cheese on a large serving plate, and drizzle poppy seed dressing over top. For fruit this week, you should receive: your choice of 3 quarts already picked, or 6 quarts pick your own certified organic strawberries, plus our organic orange juice. U-pick for fruit share members will be open from 2-6 p.m., please check in at sign in for directions to the u-pick field. If you’d like to pick more than your allotted 6 quarts, we may have enough, just check at sign-in at the stand and we’ll let you know. Children are welcome to pick, under careful adult supervision! Please take care to tip toe around the strawberry plants, because they are very close together and we want to avoid squishing berries as best we can. Baby strollers will not fit through the rows. Please do not bring any pets to the strawberry field. Thank you for understanding! Thank you all for your thoughtful responses to our CSA satisfaction survey! We really appreciate the time you all took to answer our questions, because we believe it will help us continue to improve our farming efforts. Because we can’t respond individually to all of you, we’re going to attempt to answer the majority of questions and comments we received in regards to this year’s CSA here. An overwhelming number of comments indicated that you’d like to see more broccoli, cauliflower, cabbage and Brussels sprouts! We do too! The past few years, we have invested a lot of money into starting these crops in our greenhouse, transplanting them in the fields, and tending to them only to have them be killed by a pest called “Swede midge”. This pest has eradicated the above crops for the past couple of years without fail, despite our efforts to thwart them! They live in the ground over the winter and emerge when the ground thaws, damaging seedlings in the greenhouse as well as newly transplanted seedlings in the fields. However, we recently discovered an organic treatment that is supposed to stop the Swede midge from damaging the brassicas. We plan to grow broccoli, cabbage, cauliflower and Brussels sprouts this year as usual, and are hopeful that the organic treatment will work as it’s supposed to! Another pest, the spotted wing drosophila, did some damage to our blueberries and raspberries last year. Growing fruits and vegetables organically is always challenging, and this new pest is proving to be very destructive. However, we are collaborating with an IPM (integrated pest management) professional who has organic solutions on dealing with spotted wing drosophila, so we are looking forward to saying goodbye to this pest! We received quite a few suggestions to move Thursday’s pickup day to Friday (same pickup times are usual, 3:30-6:30) because it would give members more time to process their produce over the weekend. It might also make it easier for some members to make it to the farm before 6:30, because some people get out of work earlier on Fridays. If we do change to a Friday pickup instead of Thursday, Tuesday’s pickup would stay the same (3:30-6:30). Please let us know your thoughts on this proposed change! Another common request was for us to increase the amount of “common” vegetables such as carrots, lettuce heads, cucumbers, green beans, sweet corn etc. We will do our best to offer more of these common vegetables this year, although please remember weather conditions are always a determining factor. Eggs were another consistent request. In the summer months, we do not have enough time to spend tending to a huge flock of chickens, so we are currently selling certified organic eggs from certified pastured hens from a local farmer friend. As long as our partnership with this farmer works out, we should have more than enough eggs for everyone that wants to purchase them year round in our farm store! A few crops such as popcorn, melons, and dry shelling beans simply did not work last year due to extremely wet weather conditions. We will of course grow them again and hopefully the weather won’t be too severe for them! A mushroom share option should be available for this coming season. We will send out information on that as soon as Van and Pete, the mushroom growers, have their information ready! Popular options like u-pick tomatoes, peas, string beans, and u-pick herbs and flowers will be available as usual, and we plan to make continuous improvements such as increased weeding efforts for easier picking! Our bakers plan to offer an even greater number of baked good options, including but not limited to more bread, gluten free/vegan options, frozen pies for you to take home and bake, and so much more! We have so many new ideas and plans for this coming year! New equipment for more efficient weeding and transplanting is on our list, new methods to combat destructive insects, and new fruits and vegetables to grow. We are studying our seed catalogues and ordering so many seeds (many old favorite varieties and some new ones too) which we will begin to plant in our greenhouses in a couple of months. For anyone that indicated an interest in simply shopping in our farm store in lieu of purchasing a share, please do! Our little farm store is open year round, and our farm stand will be open in addition to the store beginning with strawberry season in June. One final idea we have is to offer a farm “open house/ work day” during the summer, where any CSA members that are interested could come to the farm for a tour of nearby growing fields, a potluck lunch where everyone brings a dish to share, and perhaps a farm project such as weeding, staking tomatoes, or harvesting a crop. This of course would be optional, but we’ve received a lot of interest in this idea so we will do our best to implement it this coming year! If you have any questions or comments about this coming year’s CSA, please send them our way! The 2018 CSA flyer should be available soon, with early bird discounts for anyone signing up before Christmas. If you plan to order a “Harvest Basket” of mixed vegetables for Thanksgiving, please place your order by Friday, November 17th. Please note this basket is not related to the first winter CSA pickup! -Baskets are priced at $45, but valued at $55 based on current veggie prices in our store, so you'll save $10 by ordering one! Each basket will contain a variety of root vegetables, winter squash, herbs, and hardy greens. -To place an order, call us at 716-655-4486 or email thorpesfarm@verizon.net before November 17th. -You may pick up your basket on November 21 or 22, at our farm store, between 9 am and 6 pm, just let us know which day you prefer! Our farm store will be closed on November 23 and 24 for Thanksgiving, but we will be open for normal hours the rest of the week (Monday-Friday 8:30-6:00, Saturday 8:30-5:00). * This is our last week for summer vegetable CSA, but our new Winter CSA starts shortly, combining our organic NY vegetables and our organic Florida citrus and juice. Information should be on our website and a paper copy available by tomorrow. * For vegetables this week you should get: red potatoes, blue potatoes, garlic, onions, sweet potatoes, carrots, turnips, red meat radishes, daikon, spaghetti squash, pie pumpkins, acorn squash, butternut squash, jalapeno peppers, sweet peppers, green kale, red Russian kale, Asian salad greens, arugula, and collards. * Andrea Bemis, a fellow CSA farmer, has a wonderful selection of radish recipes that we really recommend (as well as all of her other recipes and her CSA-focused cookbook!). Click on the link below to see her radish recipes! * We thank you so much for trusting us to be your farmers this season, and hope to see you throughout the winter months whether through joining our winter CSA or by visiting our farm store. The farm store will be open through the winter, Monday-Saturday with winter vegetables, citrus, baked goods, dry goods and more! 4 tbsp. whey (you can make your own by straining plain yogurt). Mix well and pound to release juices. Place in wide mouth quart jar and press lightly until juices come to top of mixture, which should be at lease 1” below top of jar. Cover tightly and keep at room temp. for 3 days, then refrigerate. You can also mix in any ratio you wish of shredded carrots, onions, garlic, hot peppers, fresh grated ginger, etc. (Don’t go too heavy on ginger or pepper). * The weather is transitioning to typical fall temperature now, and it is nearly time for our summer CSA season to end. This is the last week for fruit shares, but vegetable shares don't end until next week: Nov. 7th and 9th, due to starting later because of the cool, wet weather at that time holding off vegetable ripening. Thanksgiving is just around the corner! See below for information on how to order homemade pies, dinner rolls, and turkeys from the farm. We hope to have our winter share information ready in several days, and you will be the first to get it! * For organic vegetables this week we should have: red and blue potatoes; onions; garlic; butternut squash; pie pumpkins (perfect for roasting/soups/stews/baking etc.) ; sweet, bell, and banana peppers; hot jalapeno peppers; radishes; turnips; carrots; red Russian kale; green curly kale; Asian salad greens; arugula; mustard; tatsoi; and celery. * We have noticed many of you left your tatsoi, possibly due to the fact you weren't sure how to prepare it. It's absolutely delicious, and very similar to bok choy! For the easiest preparation, we like to chop the stems into ½ inch pieces, and saute them in a bit of olive oil and sesame oil for a couple minutes, then add the leaves and cook until wilted. Finish with more sesame oil to taste, salt, and toasted sesame seeds for a delicious side dish! Tatsoi can be used interchangeably with bok choy in recipes, and it does wonderfully in soups, especially coconut milk based curries. * For fruit this last week of fruit shares there will be Dan Tower's delicious apples of many varieties, bosc pears, and our organic orange juice. -Our thanksgiving turkeys were raised by Naomi and Hannah this year, and were fed our own organic grains grown on the farm, in addition to loads of our own fresh, organic produce. They are free range, meaning they can roam around their pen at will, and go outside anytime they desire. Turkeys should average around 15-20 lbs. each, and the price is $5/lb. They will be available chilled, but not frozen. To place an order, please email naomithorpe14@yahoo.com. Once Naomi confirms your order, plan on picking your turkey up at the farm store on Wednesday November 22, from 4-7 p.m. Pie order pickup will also be at this time. Please place your orders before November 18th. Orders can be placed by calling 716-655-4486 or by e-mail at thorpesfarm@verizon.net. Pies and dinner rolls will be available for pickup at the bakery on Wednesday,November 22, between 4-7 p.m. Cash or check only please. All pies (except for gluten free pies) are made with certified organic wheat flour, organic raw cane sugar, organic butter, organic eggs, and real spices. (pies marked with an * can be made gluten free for an extra $2.00/pie) Pies in glass plates cost $3 more as they hold a bit more fruit than aluminum tins, but they can be cleaned and returned to the farm for a $2 refund if you desire. This past week was incredibly busy! We’ve been blessed with great weather for the past couple of weeks, and we’ve taken full advantage of it. This time of year is a race to get any and all frost-tender vegetables harvested and stored before frost kills them, and it’s also the time of year for certain fall crops to be planted such as garlic and cover crops to improve soil health. Our large grain harvest is also beginning, which means we are combing crops such as organic soybeans, oats, and corn. Winter CSA information should be available this week, as well as thanksgiving baked good order forms. For vegetables with week, you should receive: onions, potatoes, garlic, turnips, carrots, red meat radishes, daikon radishes, peppers (bell, Italian, banana, jalapeno), eggplant, fennel, spaghetti squash, acorn squash, Asian salad mix, arugula, kale, and leeks. Fruit shares this week will receive: pears, apples and our own organic orange juice. * For organic vegetables this week we think we should have: green or purple string beans (depending on whether we get a frost tonight! ); onions; garlic; potatoes; sweet potatoes; tatsoi; Asian greens; arugula; mustard greens; broccoli raab; dill; cilantro; bell, Italian, banana, and jalapeño peppers; eggplant; carrots; turnips; lacinto kale; celery; butternut squash; and unlimited PYO tomatillos and string beans to preserve for winter. Also, there may be the last sweet corn, although it is smaller and will be fewer than usual if we can get it to you. The sweet corn will only be available if we don’t get hit with a frost tonight. Our crew is smaller now with young people back to school and college, and one young lady, Megan Gerde, going back to Haiti where she works to help locals grow food. There is so much to pick it keeps us very happily busy! If you’d like to pick your own string beans today (Monday) before the potential frost, you are more than welcome to! * Our oldest daughter Abigail, who bakes a good portion of the goodies at the stand as well as helping with this newsletter, doing most of the website and flyer management, marketing, and all sorts of creative stuff the older people in this family are not so good at.......anyhow she got married Saturday (at our house) to Van Scholten, who you probably have seen at our farm. Van grows fantastic mushrooms, and you may see them offered in our 2018 CSA. Our daughters made a good portion of the food for the wedding featuring our own produce, including the recipes following for "Butternut Squash Bisque" and "Lacinto Kale Salad". It was delicious, and we are so honored to have such a great new son-in-law. * The tomatillos are offered unlimited PYO this week, and are just downhill from the tomatoes across the road. Ask at the tent for directions. They should be flagged. The string beans are on Two Rod Rd., the same as last week. Method: Preheat oven to 400 degrees. Cut squash in half lengthwise, scoop out seeds and discard. Sprinkle salt and pepper onto the cut sides of the squash, and drizzle a couple tablespoons of maple syrup on the cut side of the squash. Place skin side down inside a large roasting pan, add a few tablespoons of water to the bottom of the pan, and cover tightly with a lid or tinfoil. Roast for approximately 45 minutes, until squash is very tender when pierced with a fork. Once the squash is tender, remove the lid/foil and roast for an additional 10 minutes until the squash takes on a golden caramelized color. Remove from oven and cool. While the squash is roasting, add the onion slices, the diced, peeled apple, and 2 tablespoons of butter to a large soup pot, and cook over low heat until the onions take on a deep caramel color. This will take about 30 minutes. Add 3 cups broth to the onions once they’re caramelized and bring to a simmer. Scoop squash out of the skin and add it to the broth. Simmer for a couple minutes, adding salt and pepper to taste. Transfer soup to a blender or food processor, or use an immersion blender to blend until smooth. Add the cream, and taste for salt and pepper. If the soup lacks sweetness, a couple tablespoons of maple syrup or honey is delicious. If you’d like a garnish for the soup, remove the stems from a bunch of fresh sage, and add them to a saucepan along with 2 tablespoons of butter. Cook over low heat until the butter is nicely browned and the sage is browned. Top the soup with a drizzle of browned butter and bits of crisp sage. Method: finely slice kale into ribbons, and toss with the quinoa, roasted vegetable of your choice, and diced apples. Wisk mustard, maple syrup or honey, apple cider vinegar, olive oil, and salt and pepper together. Pour over kale and quinoa, toss well, and taste for seasoning. Add more salt/pepper/maple syrup to taste, and serve with a handful or toasted seeds! This “recipe” is so adaptable depending on what’s in season. No quinoa? No problem! Just cook your favorite grain such as barley or farro and use in place of the quinoa. *There should be lots of different varieties of apples, bosc pears, and our organic orange juice. * The pears are a different variety this week: Bosc. They can be eaten right away if you like them crispy, or let them set at room temperature until they are more golden colored if you like them juicier. * For organic vegetables this week we expect to have: vegetable spaghetti; corn for decoration or cornbread; green and/or purple string beans; onions; garlic; Asian greens; tatsoi; arugula; lacinto kale; dill; cilantro; sweet belle, banana, and Italian peppers; hot jalapeno peppers; carrots; Hakurei turnips with greens; sweet potatoes; and PYO herbs, flowers, and string beans. * The corn this week is for decoration and/or grinding for cornbread. I discovered that if I didn't dry it at all, but just used it right away before it got hard and dry, I could grind it in my coffee grinder or with the metal blade in my food processor into a beautiful yellow flour. Of course it is still slightly moist so needs to be frozen or used right away. My favorite recipe for this is: 1 cup corn flour, 1 cup flour, 4 teaspoons baking powder, 1/2 teaspoon salt, 4 tablespoons sugar or 3 tablespoons honey; mix, then add 4 tablespoons (1/2 stick) butter, melted, and 1 cup milk. Bake at 425 degrees in a buttered 7" x 11" or similar sized glass pan for 20-23 minutes. I have celiac disease, though, so to make it gluten free I simply substitute Bob's Red Mill 1 for 1 gluten free flour blend for the flour, and if you have egg sensitivity Ener G egg replacer also works well in this recipe. The fresh corn is delicious this way and kids have a fun time shelling it. It can also be ground in a mortar and pestle for an old fashioned effect. The bread is great hot drizzled with maple syrup! * The string beans are finally ready to pick your fill of. They are on our land on Two Rod Rd., 4 miles or so north of the farm. Please get directions and a map at the stand. * We may not be able to get the regular potatoes dug with all the rain we are just getting, but we still hope to be able to pull the sweet potatoes. For fruit there will be Dan Towers apples and pears, and our own citrus juice. We'll see you at the farm! * For organic vegetables we should have: acorn squash; Hakurei turnips with tops; cornstalks; red Chieftain potatoes and/or Satina gold potatoes; green beans; cooking onions; garlic; summer squash; Asian greens; arugula; Tokyo Bekana (see below for cooking notes); dill; sweet bell, banana, and Italian peppers; maybe the jalapenos will start this week also; eggplant; the last few tomatoes; tomatillos; carrots; and PYO herbs and flowers. U-pick green beans may be ready for u-pick, but check at sign-in for more information. * The sweet onions you were getting are done now. Sorry if you had to do a little corrective surgery lately on them, but they were great while they lasted. The cooking onions will not be as large, and of course have a stronger flavor, but hopefully they won’t have the occasional brown, soft layer the others had. *The cornstalks can be used for fall decoration, just know that they take a fair amount of space in cars! * Tokyo Bekana is a crunchy salad green, similar to lettuce. It is fairly mild in flavor, with a mild crunch if eaten raw. It can also be sautéed with a little ginger and garlic, then tossed with soy sauce (or tamari), toasted sesame seeds, and a little rice vinegar. Or, simply use the greens like you would use bok choy! The Asian greens you’ll receive this week may be used as salad greens, or sautéed and served as a slightly bitter green side dish. They are also delicious tossed into brothy soups! * You will be getting Dan Tower's apples and pears, Paul Crist's organic grapes, and our own organic orange juice. Ask at the stand about PYO organic red raspberries in the back. * We thank The Lord for such great weather to help our crops finish out! We anticipate having organic: butternut squash; Hakurei turnips with greens; potatoes (probably Red Chieftains); dill; onions; either celery or fennel; garlic; summer squash; kale; Asian salad mix; arugula; tomatoes; tomatillos; cilantro; peppers; eggplant; and PYO herbs, flowers, and tomatoes. * We would have more carrots, but the gravel ground they are on (which kept them from drowning earlier this season) is now so hard we can't get a harvesting fork into it to get the carrots out. They will come again as soon as the ground softens up. * We will start to harvest cornstalks soon, but they are still pretty green. * Recipes for turnips and greens listed at the bottom. * You should be getting Dan Tower's apples and pears, Paul Crist's organic grapes, and our orange juice. * If you wish to purchase organic grapes for making juice, they will be the same price as last year: 8 quart baskets $17 for fruit share owners, $1 more for non-fruit shares; 1/2 bu. for $29 for fruit share owners; $31 for non- fruit share owners. You can place orders for next week, and they will be picked special for you. We pick on Tuesdays. Sterilize your jars and lids. Stem, wash, and drain grapes. Put 1 cup of grapes into each quart jar. Add 1/3 – 1/2 cup sugar (we use 1/3 cup). Ladle boiling water into jars leaving 1 inch headspace. Wipe the rims and seal the jar. Process in a boiling water bath for twenty minutes (start counting once the water has reached a boil). The longer the grape juice is stored the more concentrated it gets. We usually start using it around December. You can double the grapes and sugar and dilute it later if you prefer. We'll look forward to seeing you at the farm! Hakurei Turnips are great raw sliced in salad or steamed or baked with butter, salt and pepper. Turnip Fries (A creative alternative to potato fries!) Turnips, peeled and chopped into French-fry strips, olive oil & sea saltLightly coat turnip strips with olive oil. Place on a flat baking sheet and sprinkle with sea salt. If desired, also sprinkle with your favorite herbs and spices. Bake at 350 degrees for 20 min.Note: Our favorite way to eat turnips is raw. They are great just sliced and eaten fresh. * For organic vegetables we expect to have: purple and gold potatoes; sweet Ailsa Craig onions; celery; garlic; edamame beans; summer squash; kale; collards; Asian salad mix; cilantro; dill; basil; tomatoes; tomatillos; peppers; eggplant and other PYO herbs and flowers in the field behind the stand. *Our apologies to Tuesday families, as we were unable to get your purple potatoes and edamame beans in time. You will definitely get them this week! * The PYO tomatoes are still open. We have to check the field today, but the late planting of tomatoes may also be ready. We will let you know at check in. * The celery you’re receiving again this week is a fantastic addition to last week’s tomato soup recipe! Simply saute chopped celery in about 3 tablespoons butter or olive oil along with a couple chopped onions and chopped fennel bulbs if you have any leftover (carrots are nice too!) until tender, and sweet. Then add in approximately two quarts of tomatoes (cores removed). We leave the skin on the tomatoes but if you prefer a smoother finished product, remove the tomato skins by dipping whole tomatoes in boiling water for about 60 seconds, let cool, then slip the skins off and continue. Along with the tomatoes, add 2-4 cups chicken or veggie stock, depending on how thick you want your soup to be, and simmer for 20 minutes. Taste for salt and pepper. If the soup isn’t sweet enough, add a couple tablespoons honey or maple syrup. Transfer to food processor or blender, and puree until smooth, or stop when it reaches your desired consistency. You can finish the soup with a cup of cream, or simply drizzle with good quality olive oil before serving. Fresh parsley and basil are delicious additions. * For fruit this week you should receive: Dan Tower's pears and apples; Paul Crist's organic Niagara and Concord grapes; and our orange juice. * You may also pick a half pint of red fall raspberries if you choose to. Check in with Candy at fruit share check in for directions to the raspberry field. * For organic vegetables we expect to have: gold and purple potatoes; fennel; garlic; sweet onions; summer squash; kale; dill or cilantro; basil; tomatoes; and the first: celery; Asian salad mix; arugula; peppers; tomatillos; and edamame beans. * There are still pick your own zinnias and herbs behind the stand. Please only cut off the flower buds from the zinnias, don't pull the plant in any way. They will keep producing flowers until we have a frost, as long as we only cut the top blossoms from the plants! The calendula is loaded, so take advantage of it before it's gone! * You can still pick your own tomatoes across the road. * The purple potatoes are a variety call Bora Valley, and they are a beautiful indigo purple inside and out. They have an excellent flavor and are good steamed mashed, fried, or baked. They have very high antioxidant levels, so are especially good cancer fighters. They are also attractive on your plate, retaining their bright color. * Edamame beans will come right on the plant. You pull off the pods, boil them for 3 minutes, rinse in cold water, then strip the tasty, nutty, buttery flavored beans out of the pods by hanging onto the stem end and squeezing out the beans. If you lightly salt the pods after cooking them, you can place the whole pod in your mouth and pull the beans out with your teeth! They are great as a side vegetable or on a salad, or just as a snack! * Fruit News: as the season progresses it is inevitable that some of our favorite fruits come to a stop. We are sad to see them go, but are happy to start the Asian pears. * Tentatively we hope to have from Dan Tower's trees: apples; pears; Asian pears; and the last few peaches. * You will also get our orange juice. As of this writing we can't get through to our friend and helpers near our Florida grove, so we can't tell yet what damage may have been sustained there. It is on high ground, so we aren't worried about flooding, but we are concerned about wind damage. We will keep you posted when we find out. * You can also pick your own organic red raspberries, a half pint per fruit share., behind the stand across from the herbs and flowers. 4 lbs tomatoes: Wash and slice thick. I used whatever tomatoes I had from the farm; slicing tomatoes and cherry tomatoes. I sliced the cherry tomatoes in half. 1 large or 2 medium onions: Cut in thirds. I had two medium onions. 3 medium fennel bulbs: Washed, cored, and cut in half lengthwise and then across. I cleaned the stalks and gave them a rough chop. 1 bulb of garlic: Washed and left whole. You may need three baking trays. Place all of the vegetables on the trays lined with parchment paper. Drizzle the vegetables with olive oil and sprinkle with salt and pepper. Bake at 425* for 30 minutes. Allow to cool completely. Using a Nutribullet, purée the vegetables in batches. Blend the batches thoroughly in a Dutch oven (or in a bowl if you wish to refrigerate for later). At this point it may be hard to not eat the soup. It's lovely as a cold soup at this point. For a thinner hot soup, heat in the Dutch oven with a homemade broth of your choice, and possibly cream . Garnish with shavings of Parmesan cheese and croutons. Basil is an option. PS. The Nutribullet worked really well to purée the cooled vegetables. It seemed easier than then a hand blender or the standard heavy-duty blender. Method: place all vegetables on baking sheet, cut side down. Turn oven broiler onto high, and adjust oven rack a few inches below the top broiler elements in oven. Place sheet tray of veggies on top rack and broil for 2 minutes. After 2 minutes, rotate pan. Keep checking and rotating the pan every minute, and remove veggies once they're all lightly charred and blackened. At this point, you can let the veggies cool, picking off any especially charred skins, and then place in food processor with the zest and juice of the lime and a sprinkling of salt and pepper. Pulse until mostly smooth, with a few small chunks remaining. This can also be done while the veggies are hot. Taste for seasonings and add more salt as needed. * We apologize for the late newsletter as we were closed for the Labor Day holiday. * For organic vegetables we should have: gold potatoes; tomatoes; garlic; Ailsa Craig sweet onions; sweet corn; basil; kohlrabi or escarole; kale; dill; string beans; PYO herbs; and PYO flowers. * Please bring scissors or clippers for the zinnias, and only cut the flower blossoms you are taking, not the whole plant. If everyone is careful, there should be flowers until frost. Last time some individuals didn't understand and pulled whole zinnia plants, and trampled others. Zinnias keep coming back if we give them the chance. * On the other hand, the basil across the driveway from the flowers and other herbs is quite large, and you can really cut these whole plants, hang them in a dry, airy spot, and dry them for your use all winter, or make huge batches of pesto and freeze them. Last week we had a limit of one plant per family. There is so much there, just take all you will use, because we have lots of younger basil coming in another field. * There is still unlimited PYO on all tomatoes, cherry, pink heirloom type, and round red type. The paste tomatoes, even though supposedly resistant to blight, seem to have gotten some damage from it anyway, being such a wet year. We do have another planting of tomatoes coming, which are green yet, and less weedy, for the near future. So, can, freeze, dry, make sauce, salsa, and every tomato type food your heart desires, because there is plenty! * For tree fruit from Dan Towers there is: peaches; blue prune/plums; apples; and pears, and you will also get the large 60 oz. fresh frozen Valencia orange juice from our grove in Florida. * We are praying our grove isn't damaged by the hurricane which we hear could be headed right for it. *For organic vegetables this week there should be: potatoes; garlic; Ailsa Craig sweet onions: tomatoes of all kinds: heirloom, regular red, paste, and many varieties of cherry types; loads of summer squash; string beans; kale; sweet corn; dill; cilantro; basil; fennel and PYO herbs. * In addition to all the PYO herbs you have been getting, the basil is right across the driveway from them and you may harvest more of that also if you wish, up to 1 large plant, to hang and dry for later use. * The PYO zinnias need a break this week, but should be ready to pick again next week. * The tomatoes are all available for any adventuresome individuals to pick unlimited amounts of. Please park on the mowed, grassy areas marked with the parking signs. Bring your own picking baskets. The area to pick in is huge, with very long rows with field driveways in between. Unfortunately, you would probably get stuck if you drove down them as wet as it has been this year, so the walk may be a long one, but there are loads of tomatoes of all kinds at your disposal if you can tolerate picking around the very tall weeds. Please don't think they are all gone if you just check the beginnings of the rows, because there are large quantities of them out there if you go further into the field. * Have your summer squash recipes handy because there are loads of them! * You will receive generous quantities of string beans but the PYO on them has not started yet. * The onions you are getting are sweet and will not store at room temperature very long. Please refrigerate them with some air flow for best results. * You should be getting: peaches, apples, nectarines, and pears from Dan Towers, plus our orange juice. * The Bartlett pears are still very firm, and not ready to eat until you place them in a brown paper bag with an apple for a few days or maybe even a week. This tends to ripen them faster so you can eat pears sooner. * For organic vegetables this week we expect to have: garlic, cherry tomatoes, regular size round red tomatoes, heirloom type pink tomatoes, onions, sweet corn, potatoes, kale, collards, basil, dill, cilantro, "pick your own" herbs including anise hyssop, catnip, mint, calendula, sacred basil, marjoram, and now oregano, and also new for this week are "pick your own" zinnias - a handful of stems to brighten your table. Please bring your scissors and bags or containers to put your flowers and herbs in. * The basil, dill, and cilantro are unlimited for large shares this week so you may want to plan for dehydrating and/or freezing pesto, etc. One no-cost way to dry thoroughly is to place, for instance, your calendula blossoms on window screen which is propped up in the air between two chairs, and placing in a covered, airy area like your porch or open garage. Make sure everything is crispy dry before storing in labeled glass jars. * There will be limited "pick your own" tomatoes again this week, up to an 8 quart basketful for the large shares and 4 qt. basket for a small share. The rows will be labeled with colored flags so you know what is in that area. There are many kinds of cherry tomatoes to choose from, and they have orange flags. The pink heirloom types have blue flags. The regular round reds have white flags, and the paste tomatoes are just starting and have yellow flags. * We love to make a delicious slow roasted tomato sauce. Use any tomato, cut it in quarters, add quartered onions, garlic, chopped fresh herbs, like basil and oregano, salt and pepper. Coat everything with olive oil. Bake in a relatively shallow glass pan, stirring occasionally, at 350 degrees or so, until it is thick, at least a couple hours. You can leave it chunky or puree it. You can also roast your leftover fennel with this mix. * I (Gayle) have an apology to make. This year, being so wet, made weed control much trickier. To make things even worse, with my husband Mike being so afflicted with late stage prostate cancer, I have not been able to get to the field to use all the weed control devices that I would have, that are usually "my job". Therefore, tomato picking this year will be like going on a safari. The weeds are quite formidable. However, the tomatoes are bountiful and you will be rewarded for your efforts. Please keep praying for Mike. The particular cancer he has, the most aggressive form of prostate cancer there is, is most commonly found in farmers or farm workers who have handled the farm chemicals we used to use (thinking we had no options at the time). Even though we went completely organic in 1999, these chemicals bioaccumulate in the soft tissues and come back to get you as you get older. We have hated chemicals for years, and even more so now. * For fruit this week you should get: Peaches, nectarines, white doughnut peaches, apples, apricots, and our orange juice. * There may still be PYO blueberries. Just ask us. * The peaches will still be available at very reasonable prices, reflecting this year's bountiful crop. They tend to stick to the pit more this year, which is common in wet years. I just canned mine as slices and they are delicious! * For organic vegetables this week we anticipate: Red and/or Gold Potatoes; Garlic; Fennel; full size and cherry Tomatoes; Basil; Sweet Corn; Cabbage; Kale; Cucumbers; Lettuce; Dill; and Sacred Basil. Also available are the "pick your own" herbs of calendula, mint, catnip, anise hyssop, marjoram, and additional sacred basil if you would like more. If you're not familiar with the u-pick herb field, just ask at CSA sign-in! * Please pick all you would like of the herbs listed above because there is plenty and if we don't keep them picked, they will go to seed. You can dry them for later use for tea, medicinal, and culinary uses. Just bring scissors and something to clip them into. Only clip/pinch the top inch or so of the plants so the bottom can continue to grow. For calendula, simply pluck off the flower head, leaving the stem on the plant. * When we went to pick the fennel last week, we discovered it would benefit from 1 more week of growing time, so you will get it this week instead of last. * There may be limited "pick your own" tomatoes starting this week. Stay tuned for further notice during CSA pick-up. * The tomato varieties ready now include the large, sweet cherry called "Mountain Magic" which is so packed with flavor, and also a new full size variety which is named "Damsel". It is of the heirloom family type, with pinkish/red tender skin, and the best tasting full size tomato we've had in a long time. Because it is an heirloom variety, it can be more tender and easily bruised, so extra care needs to be taken in picking and handling, and also it can crack more readily. We think the fantastic taste is worth the effort! We also have the regular red round variety, "Iron Lady". Ingredients- 1 bunch kale, center ribs removed. 1-2 kohlrabi bulbs, peeled. 1-2 crisp apples. 1/2 cup toasted sunflower or pumpkin seeds. Juice of one lemon. 1 teaspoon coarsely ground mustard. 3 tablespoons olive oil. 1 teaspoon honey. Salt and pepper to taste. Method: slice the kale into really thin ribbons and place in bowl. Shred peeled kohlrabi on the largest holes of a box grater, or dice them finely and add to kale. Shred or dice apples and add to kale. Whisk mustard, honey, lemon juice, olive oil, freshly cracked pepper, and a few large pinches of salt together, then add to the kale mixture and knead the dressing into the salad with your hands for a couple minutes. Add toasted seeds before serving. This salad makes a nice lunch with the addition of quinoa or grain of your choice! * There is quite a lot of variety again this week! There should be from Dan Towers: regular peaches, very sweet white peaches, doughnut peaches, apricots, yellow plums, and apples. You will also be getting our own organic Valencia orange juice. * There are loads of our organic blueberries waiting for you to pick them at very low PYO prices. Bring all your family and friends. This is definitely the year to stock up on blueberries for smoothies, preserves, juice, pancakes, pies, muffins, etc.! This week will most likely be the last week we are open for u-pick so don't miss out. Tuesday and Thursday u-pick hours are 9-6, and Saturday's hours are 9-5. * We look forward to seeing you all at the farm and in the blueberry field! * For vegetables this week we should have: red potatoes; garlic; sweet corn; cabbage; collards or kale; fennel; tomatoes; basil; cucumbers; summer squash; and possibly more kohlrabi. * For U-Pick herbs there are: catnip; mint; sacred basil; and anise hyssop. Catnip is best noted for pleasing your cats, but can also be enjoyed as a tea for human consumption. Mint is used in tea and also in cooking; sacred basil is used medicinally as an immune stimulant and an anti inflammatory, as well as in tea; and anise hyssop has a sweet, licorice mint flavor and can be used fresh or dried in salads and teas. *Fennel has a mildly sweet, licorice flavor when raw. When roasted, the licorice flavor subsides and it takes on a delicious new flavor. We especially enjoy roasting fennel alongside roasted chicken. Raw fennel is wonderful when shaved or sliced thinly, and tossed into salads. You can also thinly slice it and saute with thinly sliced onions over low heat, along with a little butter or olive oil, until both the onions and fennel are really golden and tender. This makes a delicious topping for toasts, and it's especially good spread on bread before making grilled cheese! * You should be getting Dan Towers apples, peaches, apricots, plums, and a special, sweet eating peach called a donut peach, as well as our orange juice. * The organic blueberry bushes are still absolutely loaded, and we also have great sales on PYO blueberries to encourage you to put lots of them away for winter. U-pick will be open Tuesday (9-6), Thursday (9-6), Friday (9-6), Saturday (9-5). $1.90/lb. for less than 10 lbs. $1.50/lb. for 20 lbs. or more! $2.50/lb. for less than 10 lbs. $2.00/lb. for 20 lbs. or more! * For organic vegetables this week we anticipate: collards; kohlrabi; cabbage; green onions; garlic; potatoes; beets; lettuce or escarole; cucumbers; summer squash; and baby sweet corn. * The first variety of sweet corn, Trinity, we started in the greenhouse and transplanted so you could have it earlier. Unfortunately, it decided the wet spring weather was too stressful, and as a result the ears are embarrassingly short. They are quite sweet, though, so we thought we would pick them anyway, and perhaps they can enhance a dish you make this week! * The tomatoes are just starting so if you do get some this week they will be in small quantities, but there are loads coming soon. * We’ve noticed a lot of escarole is getting left behind during pickups, which is fine if you don’t enjoy it. If you’re running out of ideas on how to use it, check out the link below for 21 different recipes starring this delicious, slightly bitter green. Escarole wilts down similar to spinach or other greens once cooked, so what looks like a large head will reduce to a small, manageable amount with a little heat! *Collard greens are new for this week, and they are an incredible source of vitamins, minerals, iron, and fiber. They can be enjoyed raw or cooked. You can use collard greens as a wrap in place of a tortilla or bread, and they are also delicious when sliced thin (remove the center rib first) and added to salads or slaws. If smoothies are your thing, you can use collards instead of spinach or kale to add a green boost to your smoothie. This works especially well if you have a high powered blender. For easier digestion, try steaming collard greens (with the middle stem removed) for a couple minutes, then chill in ice water before wringing excess water out. Steamed greens can be frozen and then added to smoothies! Collard greens are a treat when sautéed in a little bacon fat, and served alongside bacon and eggs. *If kohlrabi is new to you, get ready for a mildly sweet, super crunchy vegetable that’s really versatile. For a simple preparation, peel kohlrabi well, and thinly shave or julienne and add to your favorite slaw recipe. If a mayo based slaw isn’t your thing, try kohlrabi julienned with thinly sliced apples, minced fresh herbs of your choice, some toasted nuts, and a simple dressing of olive oil and white balsamic. Season with salt and pepper. Kohlrabi can also be roasted or steamed, just peel off the tough outer layer first! Once steamed, you can even mash it with butter and cream like you would for mashed potatoes. Kohlrabi stores well in the fridge, just keep it in an open bag in your crisper and it should last for a couple of weeks. * For fruit this week there is quite a lot of delicious variety: peaches, apples, nectarines, plums, and apricots from Dan Towers, our orange juice, and our organic blueberries. * "Pick Your Own" organic blueberries are still in great quantities, plump and sweet. We will be open for PYO : Tuesday 9-6, Thursday 9-6, Friday 9-6, Saturday 9-4. Picking is as good as it will be this season, so if you haven’t picked yet, or would like to pick more, come out this week before picking conditions decline! For the simplest blueberry preservation, just toss them in freezer bags as soon as you get them home. They also make wonderful jam, and if you’re making a cooked jam, they contain enough natural pectin that you won’t need to add additional pectin for thickening. The sale pricing from last weekend is still in effect this week: $2.00/lb for fruit share members if you pick less than 10 lbs. or $1.90/lb if you pick 10 lbs. or more. * For organic vegetables this week you should receive: red potatoes; garlic; green onions; zucchini; cucumbers; dill; lettuce; escarole; Swiss chard; kale; basil; and maybe even the first small sweet corn ears. * The u-pick herb field behind the stand is starting to have a few things ready. If you bring your own scissors or pruning shears, you may want to harvest your own : calendula blossoms, catnip, and/or mint. The calendula you only harvest the orange flowers; just gently grasp the plant in one hand and the blossom in the other, then pull the blossom off the stem. For mint and catnip, just pinch off a small portion of the top of the plant. Please do not cut the whole plant, and only take a small pinch this first week, so the plants can continue to grow and provide a bountiful harvest for later. * There will be quite a few cucumbers this week, so you may want to make some pickles! You can make quick refrigerator pickles, which are so fast and easy to make, or you can take it a step further and lacto-ferment some cucumbers or can them using the water bath approach. * Tomatoes are coming quickly, and maybe some will be thinking of giving us a tasty treat by next week. * We are in an all-out battle with weeds this year due to so much rain, not allowing us to cultivate on schedule, but somehow (thank the Lord) despite the challenges, we still have a bountiful crop! * We also have araucana bantie mix chickens available for $5 each if you would like them. They were hatched by their mother hens this spring and should start to lay (mostly) colored eggs for you in a couple months. Let us know if you’d like any and we’ll do our best to catch the night before your pickup day. Just email us with the number you’d like along with your pickup day, and bring a cage or large box with holes for air circulation to carry your chickens home in! Calendula uses: calendula can be dried on a screen or mesh surface in a cool, dark place (out of direct sunlight). Light airflow from a fan is helpful. Once the blossoms are dry and crispy (no moisture should remain, so if the feel slightly tacky or damp, keep drying them). Once you’re sure they’re dry, you can store them in a glass jar in a cool dark place. Dry blossoms can be made into tea, or you can add a large handful to sunflower or olive oil to make a calendula infused oil. This oil can then be used as a skin moisturizer, or you can add a a bit of melted beeswax to make a healing salve. Calendula tea is easy to make using fresh or dried blossoms, click on this link for the method and other uses for calendula tea. For a simple refrigerator dill pickle, try this recipe in the link below. We’ve used it many times with great success, and it couldn’t be easier, especially if you use a mandolin or the slicing blade on a food processor to slice the cucumbers! * Fruit shares should include: Dan Towers peaches, plums, apricots, and apples; plus our orange juice and organic blueberries. * The blueberry fields will be open again for pick your own on Tuesday and Thursday, 9 AM until 6 PM, and Saturday 9 AM through 4PM, weather permitting. - Wow! We sure got a lot of rain! Excess rain has its drawbacks, of course, but is beats the extreme drought we experienced last year. Most crops are faring well in spite of the rain, but unfortunately, so are the weeds. This is all part of the challenge of farming organically, and our crew has been doing a fantastic job of hand weeding in between the planting and harvesting schedules. - Blueberries are ready! Anyone can pick their own this week, with or without a fruit share, so check below in the fruit share news for more info on them. - For organic vegetables we anticipate: red potatoes; garlic heads; green onions; summer squash/zucchini; cucumbers; dill; lettuce heads; red and gold beets; Swiss chard, green beans, and mint! - The shelling peas are really loaded on Two Rod Rd., and this is the last week for them, so pick all you would like. You can park all along the edge of the mowed field so you can be closer to better picking anywhere in the field. Some of the earlier peas which were not picked yet may be over-mature. Just open the pods and taste them to determine what size pods to pick. If the pod is sort of pale green, fat and bumpy, it may be past its prime. There are still plenty of perfect ones, so just bypass the others. Shelling peas can be enjoyed raw, or shelled and then steamed/boiled for about one minute. They are perfect topped with a little cultured butter, sea salt, and some minced dill. To freeze, simply blanch freshly shelled peas in boiling water for 1 minute, then immediately transfer peas from boiling water to ice cold water. Drain once they’re cool, then place in freezer bags or containers. Peas lose their sweetness quickly, similar to sweet corn, so they are best enjoyed/frozen the day, or the day after they are picked! To prepare, peel the skin from the cucumbers (reserve peels to flavor ice water for a refreshing drink! ), then cut into very thin slices. Place in colander and sprinkle about ¼ teaspoon salt on them and toss to coat. This will cause excess moisture from the cukes to drain. While they drain, mince a couple green onions, including the pale green part and place in medium bowl. Mince a small handful of fresh dill. A touch of minced fresh garlic can also be added if you enjoy raw garlic. Add about 1 cup of sour cream to the bowl, or half sour cream/ half greek yogurt and stir well. Sprinkle in a couple pinches of salt, and freshly ground black pepper, then add 1 teaspoon raw sugar or honey, plus ½ teaspoon lemon juice or apple cider vinegar. Finally, rinse cucumbers to remove excess salt, drain well, then add to the rest of the ingredients and mix well. Taste for salt/pepper/sugar and add more of each as necessary. We love this served alongside any summer meal, but especially grilled meats and boiled new potatoes. It’s also delicious as a veggie pita topping, just stuff a fresh pita with lettuce and your choice of other veggies, and top with the cucumber sour cream mixture. - Your fruit share possibilities/choices should include: our organic blueberries, organic black raspberries, organic red currants, and PYO organic red raspberries; plusDan Towers peaches and apricots; and our orange juice. You will also have the option to pick your own blueberries for a discounted rate, see below for info on that. - Currants are a bright red, beautiful berry. They are typically used to make jams or jellies, but they’re also delicious added to mixed berry pies, crisps, and cobblers to add a bit of tartness, similar to rhubarb. Click on this link for a recipe from YotamOttolenghi’s book “Plenty More”, it’s a delicious way to use summer fruit, especially currants! - The organic "pick your own" blueberry field opens this Tuesday (July 18th) at 9 A.M. – 6:30 p.m. We also plan to have the field open Thursday 9-6:30, and Saturday 9-4. The culvert (drainage pipe) under the driveway to the farthest back fields washed out in the heavy rain storm, but we are working on replacing it and hope it’s ready by Tuesday! The blueberries are loaded, better than we've ever seen them. Lisa will be at the field to tell you where to pick and weigh the berries, so be sure to check in with her first! There are big fat varieties for fresh eating, pies, jams and smoothies, and even smaller, highly flavorful varieties for muffins and pancakes. - If you have a fruit share, the price per lb. to pick is $2.00/lb. The price for non-fruit share members is $2.60/lb. - The address of the blueberry driveway is 1449 Folsomdale Rd., Cowlesville. It’s about a 10 minute drive from the farm. There is no house there, just a driveway and a propped up blueberry sign by the road. (We take the sign down at the end of the day.) The house addresses of our nearby neighbors are: 1444 across the road and 1438 just past that. - There are ponds near the blueberries, so please watch your young children to keep them safe. Children are of course welcome to pick, but please leave any pets at home. You will want to bring a pail you can tie about your waist so you can use both hands for picking efficiently, and we hope you have a wonderful, enjoyable time with your family stocking up for winter. - To freeze blueberries, simply place them in freezer bags or whatever freezer containers you prefer, and freeze! That’s it! We don’t even rinse them, because they’re organic, and also because moisture will cause them to clump together. - Your fruit share possibilities/choices should include: our organic blueberries, organic black raspberries, organic red currants, and PYO organic red raspberries; plus Dan Towers peaches and apricots; and our orange juice. You will also have the option to pick your own blueberries for a discounted rate, see below for info on that. - The address of the blueberry driveway is 1449 Folsomdale Rd., Cowlesville. It’s about a 10 minute drive from the farm. There is no house there, just a driveway and a propped up blueberry sign by the road. (We take the sign down at the end of the day.) The house addresses of our nearby neighbors are: 1444 across the road and 1438 just past that. - There are ponds near the blueberries, so please watch your young children to keep them safe. Children are of course welcome to pick, but please leave any pets at home. You will want to bring a pail you can tie about your waist so you can use both hands for picking efficiently, and we hope you have a wonderful, enjoyable time with your family stocking up for winter. - To freeze blueberries, simply place them in freezer bags or whatever freezer containers you prefer, and freeze! That’s it! We don’t even rinse them, because they’re organic, and also because moisture will cause them to clump together. We'll see you at the farm! * For vegetable shares, we expect to have: new red potatoes, the last of the garlic scapes for this season, fresh young garlic heads, green onions, either snow or shelling peas, beets with greens (see recipe below), Swiss chard, lettuce, chives, cilantro, and maybe escarole. * "Pick Your Own" shelling peas are in great abundance this week, and these pea rows are marked with white flags. There may be a few sugar snap peas left, but not a large amount, and the 2nd planting of snow peas (yellow flags) should have some left also. The rows are so long, and most people have been picking the first section of the rows. There is a hay field alongside the pea field, so you can drive to the farther areas and park on the mowed hay field there, and not have to walk so far if you want to pick at the end of the rows. Now and through next week will be prime time for shelling peas and they are quite plentiful. You may pick any day. Those tender, sweet green peas are a treasure, blanched and frozen for winter! *Naomi will have her organically fed, free range, whole chickens available for sale on July 25 and July 27 during CSA pickup times from 3:30-6:30 p.m. They are available for pre-order, just email her at naomithorpe14@yahoo.comto place your order and let her know what day you would like to pick them up. Most meat birds will average around 5lbs. each, and if you pre-order, they are $4/lb. The chickens will be available fresh, not frozen, so bring a cooler with ice in order to get them home safely chilled. * You should be getting: sweet dark cherries, sweet light cherries, our organic black raspberries and blueberries, and our orange juice. You may also pick your own red raspberries, up to a pint. * The PYO organic blueberries should be starting next week, July 18th, for fruit share members. * Apricots are not quite ready for this week, but should be ripe for next week. Beets and Greens Bowl- This recipe is very flexible! Use whatever grain you have on hand. We like to make variations of this bowl all summer long, depending on what’s in season. As long as you have a nice balance of items, whatever you substitute in will be delicious. The best grain and veggie bowls have a mixture of salty, sweet, crunchy, creamy, and acidic (think something pickled, or a chevre cheese such as feta) ingredients, so try to fill each of those categories for the most satisfying results. Method: Remove greens from beets, then chop the stem ends into ¼ inch pieces. Roughly chop the greens and set aside for later. Peel beets, then dice into ½ cubes. In a non-stick frying pan over medium heat, sautee chopped beets with your choice of oil and salt until tender. Placing a lid over the pan to create steam will speed up the process. Once beets are tender, remove from pan and add the chopped beet green stems along with a little more oil and salt. Saute stems until crips/tender, then add roughly chopped beet greens and cook until wilted. Add stems and greens to the already cooked beets and set aside. If using snow or sugar snap peas, remove stem end and the string that runs along the top of the pea, then slice diagonally into ¼ inch pieces. If using shelling peas, you can blanch them or simply toss them with the beets and greens if you don’t feel like blanching them. Wisk the lemon juice, honey/maple syrup, and chives together. Slowly drizzle in olive oil until incorporated, then season with salt and pepper. To make the bowls, put about ½ cups cooked grains in the bottom of a shallow bowl, then top with beets and greens. Scatter the peas on top, then crumble your choice of feta or chevre over everything. Drizzle with the dressing, and top with any fresh herbs you have on hand such as thyme, dill, or parsley, plus your choice of toasted nuts or seeds for crunch! * Because Tuesday is the 4th of July, and our customers, crew, and family want to enjoy this holiday with family and friends, we are having CSA pickup on Wednesday, July 5th for Tuesday’s members, and Thursday will remain the same - on Thursday. * For vegetables, we tentatively figure we should have: the 1st red potatoes; garlic heads (they are not fully mature yet, but delicious just the same); snow peas; garlic scapes; lettuce heads; Chinese cabbage or escarole; cilantro; chives; spinach if it isn't over-mature; and possibly green onions. U-pick snow, sugar snap, and shelling peas will all be available. If you don’t own a salad spinner yet, we highly suggest purchasing one! They will make cleaning and drying your greens so much easier. Greens that have been washed in a few changes of cold water and spun dry store much better than dirty greens, and if you find the time to wash them on the day you pick up your share, you’ll have fresh, clean greens to enjoy the rest of the week! * The "pick your own" peas are getting ready now. They are on Two Rod Rd., about 4 miles north of our home farm, and will be flagged with colored flags so you know which rows to pick in. Please get more specific directions during check-in on the day of your pick up, as varieties may change. We will try to have maps available at check-in for you to take. Please take care when picking the peas to not uproot the entire plant! Gently grasp the plant in one hand and the pea pod in the other to remove the pod. Shelling peas can be shelled, blanched (boil freshly shelled peas for about 1 minute, then drain and rinse with cold water), then frozen. Sugar snap peas are delicious raw. We like them as part of a crudité plate, just dip them in hummus or green goddess (recipe below fruit share news) salad dressing for a delicious snack or light summer dinner! Snow peas are fabulous in stir fries, lightly sautéed over high heat until slightly charred. They can also be grilled in a grill basket after being tossed with oil for a delicious treat. *Escarole is a leafy green that looks like a head of lettuce, but it has a bit more texture than lettuce as well as a touch of bitterness that goes well with rich meals. For the simplest preparation, just chop into bite sized pieces and sauté it with a little fresh young garlic, and olive oil. Finish with a bit of chicken or vegetable stock and serve alongside pasta, or possibly a rich cut of meat that would benefit from a bitter green. It is also delicious in broth based soups, just add it in at the end of the cooking time until it’s wilted. * Strawberries came to a sudden halt due to a nasty little bug called the Tarnished Plant Bug. Conditions were just right for it while the late varieties were blossoming. The bug feeds on the yellow blossom middles, causing the berry to have a squinched up seedy end, or not to develop into a strawberry at all. This bug has been around for a long time, only causing very minor damage, but this year the weather was very favorable for it and it did extensive late damage to our crop as well as many in the area. We have researched what organic inputs we can use to repel them for next year, but we can't undo the trouble they just did. * On the bright side, the blueberries are not affected by this bug and still look great. They are not ready for this week yet, but hopefully by the following week. * For fruit shares this week we should have some combination of sweet cherries, apples, black raspberries, and juice. We may open the strawberry field for u-pick on your pickup days if anyone wants to glean the few remaining berries. Red raspberries may also be open for a small quantity of u-pick berries, depending on how they look mid-week. We will let you know on your pick-up day at check-in. Other good news to look forward to is the apricot crop should be ready soon and it looks great! Method: Blend all ingredients in blender or food processor until smooth. Taste for salt and pepper, and adjust accordingly. Serve immediately as a salad dressing or dip for raw vegetables. Method: Mix dry ingredients together in large bowl. Add cold butter cut into tablespoons, then cut in with a pastry blender or your hands until the butter is the size of small peas. We use this topping on pretty much any fruit available! Just fill any appropriately sized glass baking pan with your fruit of choice (apples, berries, pitted stone fruit etc.) then top with the streusel. Bake at 375 degrees until the topping is nicely browned and the fruit below is bubbling. You can also use frozen fruit such as peaches, cherries or berries with great success. Serve warm topped with ice cream, whipped cream, yogurt, or plain! Well, happy pea picking! We look forward to seeing you at the farm. *For vegetables this week there should be: radishes or herbs, loads of garlic scapes, Chinese cabbage or lettuce, spinach, shelling peas, sugar snap peas, chives, and to try to "plump up" the amount you are getting, our orange juice from our Florida grove. If this is your first year with a vegetable share, rest assured that more veggies will be ready soon! *Garlic scapes will be abundant this week! Here are a few of our favorite ways to use them: chopped and sautéed in your choice of oil, then tossed with wilted greens and a splash of apple cider vinegar. Brush with oil and grill whole until charred. Pesto! Mix diced scapes into softened butter to top vegetables, chicken, steak or salmon with. Fold sautéed scapes into scrambled eggs. Mince fine, then make a sesame/soy vinaigrette with olive oil, soy or tamari sauce, toasted sesame seeds, and apple cider vinegar. Soak scapes in your choice of vinegar for a week to make garlic flavored vinegar. *Please remember to bring bags/boxes/coolers for your produce. This helps us cut down on wasteful packaging. *There may be PYO peas ready by next week, stay tuned! *Next week for the Tuesday July 4th pickup, we will be switching the pickup to Wednesday, July 5th. It will be the same time between 3:30 - 6:30. If that doesn't work for you, you are welcome to send a friend or family member to pick up your share for you. *You should receive the same share as the last 2 weeks- 3 quarts of our organic strawberries already picked, or 6 quarts PYO, plus our orange juice. If you can, please let the office know which you prefer so we can have the right amount pre-picked. The picking is still great! 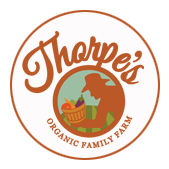 You may pick any day this week that we are open, just check our website www.thorpesorganicfamilyfarm.com for hours and u-pick updates. *Strawberries freeze well! You can rinse them after bringing them home, remove the tops, then lay in a single layer on a baking sheet and freeze until firm. Transfer the frozen berries to freezer bags and enjoy all year long in smoothies, baked goods, as a yogurt topping, and more. To simplify freezing, we sometimes don’t even rinse the berries (they’re organic after all!) as long as they don’t have any dirt or mud on them. Simply remove the tops, then place in freezer bags and freeze immediately. Cutting out the step of rinsing prevents the need to freeze them separately on trays. Combine vinegar, water, sugar, and salt and heat to boiling. Pack dill into hot, clean 1 pint jars, then pack in the scapes. Pour in the hot vinegar mixture, leaving 1/2 inch headspace. Remove air bubbles and seal. Process in a boiling water bath for 10 minutes. Let cool. Store in a cool, dry place. Do not open for at least 6 weeks to allow flavors to develop. * This is our first week of vegetable CSA. This time of year is always fantastically busy as we are trying to keep planting, cultivating, weeding, harvesting vegetables and strawberries, making hay, growing our organic grains, caring for our livestock, and finding time to "put food by" so we can enjoy strawberry smoothies, jams, green peas, as well as pickled and frozen garlic scapes all year round! Thank you for letting us be "your farmers." We hope you enjoy this busy season as much as we do! *When pulling in the driveway, use caution and pull up far enough over the crest of the hill so you can see on-coming traffic!We ask that everyone does their best to come on their chosen pickup day (Tuesday or Thursday, whichever day you chose on your registration form). Pickup hours are from 3:30-6:30 p.m., please no early-birds or late comers. If you can’t make it one week, you may send a friend or family member to pick up your share. Vegetable share pickup will be under the green and white tent near the stand. Fruit share pickup will be in the new stand. For both locations, there will be someone to sign you in, and explain how pickup works if you’re new! We will have baked goods, flours, coffee, meat and more available in our store for purchase, if you’d like anything in addition to your CSA share. *If you have any recipes you’d like to share with us that focus on CSA vegetables or fruit, send them our way and we will post them on our website for other members to try! We do our best to update our Facebook and Instagram accounts with farming notes and news, so if you’d like to stay up to date there, like or follow us! We love seeing how everyone uses their farm produce, so if you post any pictures of your creations, we’d love it if you tagged us. * For vegetables this week we anticipate: carrots (we grew these in Florida for an early treat); peas; spinach; Swiss chard; cilantro; radishes; garlic scapes; asparagus; and chives.Please remember to bring bags/boxes/coolers to carry your produce home in. * Usually we would be bombarding you with lettuce heads right now. We planted the lettuce in a beautifully fenced field so the deer couldn't get it. Unfortunately, a large extended family of woodchucks had a camouflaged underground condominium right next to the field and neatly fit under the bottom wire. There will be lots of lettuce coming from later plantings, but they got the earliest heads. * The peas are not quite ready for PYO (pick your own) yet, but will be soon. * The strawberry picking is great! We cannot believe how many berries are ripe and ready to pick.You have the same choices again this week- 3 quarts already picked or 6 quarts PYO, and can pick additional berries for the discounted rate of $2.10 per pound (non-fruit share members pay $2.50/lb.) For reference, a heaping quart of berries weighs about 1.5 lbs. and a level quart weighs about 1 lb. You will also get orange juice from our own citrus. If you only received 1 bottle of juice last week, please let Candy know at sign-in so you can grab an extra bottle this week! We miscalculated how much we needed for the first pickup. * Please call or email the office so we can plan to pick your berries for you if that is what you want this week. * You can pick your berries any day we are open, excluding Sunday and when it's raining. Just check our website www.thorpesorganicfamilyfarm.com for daily u-pick hours and info. * The bountiful strawberry crop means this is a great year to freeze extra strawberries for nutritious winter smoothies, make jam for your family and Christmas gifts, dry some for homemade granola or dehydrate and powder it for use in milkshakes or sprinkled on all sorts of goodies, puree and dry in your oven for fruit leather to send in your family’s lunches.......there are so many possibilities! Combine all ingredients in bowl of food processor except olive oil. Pulse until well combined, then pour in olive oil slowly with the food processor running. Season with salt and pepper. Pesto is delicious on top of freshly steamed or roasted veggies, grilled or roasted meat, slathered on toast, or used on pizza instead of a red sauce! It also freezes well. We like to spread it thin on a rimmed baking sheet lined with parchment paper, or non-stick spray. Once it’s evenly spread, freeze until solid then break into pieces and freeze in a ziplock bag or freezer appropriate container! It’s even simpler than ice cube trays, and you won’t have to scrub your trays out or worry about pesto flavored ice cubes. Swedish pancake cake: adapted from Green Kitchen Stories, a fabulous blog for recipe ideas that focus heavily on fruits and vegetables. If you don’t have buckwheat flour, all purpose or pastry flour works fine, but we prefer the nutty flavor the buckwheat lends. your choice of the following: fresh fruit such as sliced strawberries, bananas, raspberries, blueberries etc. Sift dry ingredients into a bowl. Whisk eggs, milk, water, and melted butter/coconut oil together, then add wet ingredients to dry. Whisk well, then cover and chill in refrigerator for about ½ hour. Batter can rest overnight if desired. Remove from fridge, heat a large (10-12 inch) non-stick frying pan over medium heat, add a pat of butter or coconut oil to pan and tilt to coat pan surface. When pan is hot, whisk batter and pour in about ¼- 1/3 cup batter and tilt pan so the batter covers the entire surface of the pan. Cook until edges begin to crisp and you can easily grab the edges and flip the crepe. The first side should take about 1 minute to cook, the other half will take less time. Cook until lightly golden but not too crisp. Continue this process until all of the batter is used. Depending on the size of your pan, this should make about 12-16 crepes. Cool crepes on a wire rack before stacking them together, this will help prevent them from sticking together. Once crepes are cooked and cooled, prepare your filling. We use a combination of sliced strawberries tossed with a bit of honey, raw sugar or maple syrup, as well as thawed frozen black raspberries and blueberries from last year. Beat chilled cream with a whisk or mixer until soft peaks form, then fold in vanilla extract and yogurt. Sweeten if desired (we like it unsweetened, to contrast the lightly sweetened berries!). Prepare the cake by placing a crepe on a large plate, and topping it with a handful of syrupy berries, then another crepe topped with a layer of whipped cream, then a crepe with jam or a thin layer of nut butter, and just keep repeating the process until all of the crepes have been used. Any excess toppings can go on top of the cake. This cake is delicious when served immediately after assembly, or even a day or two later from the fridge. If you make this cake, we’d love to hear/see your variations on it! Email us or tag us in a pic of your creation on facebook or Instagram! * This is our first week of vegetable CSA. This time of year is always fantastically busy as we are trying to keep planting, cultivating, weeding, harvesting vegetables and strawberries, making hay, growing our organic grains, caring for our livestock, and finding time to "put food by" so we can enjoy strawberry smoothies, jams, green peas, as well as pickled and frozen garlic scapes all year round! Thank you for letting us be "your farmers." We hope you enjoy this busy season as much as we do! *When pulling in the driveway, use caution and pull up far enough over the crest of the hill so you can see on-coming traffic! We ask that everyone does their best to come on their chosen pickup day (Tuesday or Thursday, whichever day you chose on your registration form). Pickup hours are from 3:30-6:30 p.m., please no early-birds or late comers. If you can’t make it one week, you may send a friend or family member to pick up your share. Vegetable share pickup will be under the green and white tent near the stand. Fruit share pickup will be in the new stand. For both locations, there will be someone to sign you in, and explain how pickup works if you’re new! We will have baked goods, flours, coffee, meat and more available in our store for purchase, if you’d like anything in addition to your CSA share. *If you have any recipes you’d like to share with us that focus on CSA vegetables or fruit, send them our way and we will post them on our website for other members to try! We do our best to update our Facebook and Instagram accounts with farming notes and news, so if you’d like to stay up to date there, like or follow us! We love seeing how everyone uses their farm produce, so if you post any pictures of your creations, we’d love it if you tagged us. * For vegetables this week we anticipate: carrots (we grew these in Florida for an early treat); peas; spinach; Swiss chard; cilantro; radishes; garlic scapes; asparagus; and chives. Please remember to bring bags/boxes/coolers to carry your produce home in. * The strawberry picking is great! We cannot believe how many berries are ripe and ready to pick. You have the same choices again this week- 3 quarts already picked or 6 quarts PYO, and can pick additional berries for the discounted rate of $2.10 per pound (non-fruit share members pay $2.50/lb.) For reference, a heaping quart of berries weighs about 1.5 lbs. and a level quart weighs about 1 lb. You will also get orange juice from our own citrus. If you only received 1 bottle of juice last week, please let Candy know at sign-in so you can grab an extra bottle this week! We miscalculated how much we needed for the first pickup. Combine all ingredients in bowl of food processor except olive oil. Pulse until well combined, then pour in olive oil slowly with the food processor running. Season with salt and pepper. Pesto is delicious on top of freshly steamed or roasted veggies, grilled or roasted meat, slathered on toast, or used on pizza instead of a red sauce! It also freezes well. We like to spread it thin on a rimmed baking sheet lined with parchment paper, or non-stick spray. Once it’s evenly spread, freeze until solid then break into pieces and freeze in a ziplock bag or freezer appropriate container! It’s even simpler than ice cub trays, and you won’t have to scrub your trays out or worry about pesto flavored ice cubes. Sift dry ingredients into a bowl. Whisk eggs, milk, water, and melted butter/coconut oil together, then add wet ingredients to dry. Whisk well, then cover and chill in refrigerator for about ½ hour. Batter can rest overnight if desired. Remove from fridge, heat a large (10-12 inch) non-stick frying pan over medium heat, add a pat of butter or coconut oil to pan and tilt to coat pan surface. When pan is hot, whisk batter and pour in about ¼- 1/3 cup batter and tilt pan so the batter covers the entire surface of the pan. Cook until edges begin to crisp and you can easily grab the edges and flip the crepe. The first side should take about 1 minute to cook, the other half will take less time. Cook until lightly golden but not too crisp. Continue this process until all of the batter is used. Depending on the size of your pan, this should make about 12-16 crepes. Cool crepes on a wire rack before stacking them together, this will help prevent them from sticking together. Once crepes are cooked and cooled, prepare your filling. We use a combination of sliced strawberries tossed with a bit of honey, raw sugar or maple syrup, as well as thawed frozen black raspberries and blueberries from last year. Beat chilled cream with a whisk or mixer until soft peaks form, then fold in vanilla extract and yogurt. Sweeten if desired (we light it unsweetened, to contrast the lightly sweetened berries!). Prepare the cake by placing a crepe on a large plate, and topping it with a handful of syrupy berries, then another crepe topped with a layer of whipped cream, then a crepe with jam or a thin layer of nut butter, and just keep repeating the process until all of the crepes have been used. Any excess toppings can go on top of the cake. This cake is delicious when served immediately after assembly, or even a day or two later from the fridge. If you make this cake, we’d love to hear/see your variations on it! Email us or tag us in a pic of your creation on facebook or Instagram! Hello from all of us at the farm! We are so honored that you chose us to be your farmers this season, and we are excited to see you all soon. If you’re new to our CSA, we send out a newsletter every Monday during the season to give you field/crop updates, let you know what you’ll tentatively (we say tentatively because your fruits and veg have yet to be picked for the week, most are picked on the day you receive them) be receiving each week, and sometimes share a few recipes that we like! If you have any favorite recipes that use produce from the farm, send them our way and we will post them on our website. Our farm store will be open during CSA pickups with baked goods, organic flours and sugar, organic coffee, beef, pork, poultry and more. It’s open to everyone regardless of CSA membership! Please use caution when entering/leaving our driveway. Be sure to pull up far enough over the crest of the hill before pulling into the driveway, so you can see oncoming traffic. Traffic on our road moves very quickly, and unless you pull up far enough before turning left into our driveway, you might not see oncoming traffic. Please bring your own bags and containers when you pick up. We encourage everyone to read the newsletter so you know what to expect for the week! After an initially wet spring that delayed some plantings, we are back on track with planting. The veggies have been loving the heat and sun these past few days, so we will most likely start vegetable shares on June 20th and 22nd, depending on which day you chose. Email us if you can’t remember and we’ll look it up for you. Vegetable shares will still receive 21 weeks of vegetables, we’ll just go one week longer in November! Stay tuned for the newsletter next Monday, which will contain what you should receive with your share, as well as other important reminders and check-in instructions. If you don’t have a fruit share, but would still like strawberries, you may pick this week starting Tuesday for $2.50/lb for under 10 lbs, or $2.30/lb for 10 lbs. +. Our website will be updated every morning with u-pick info, as well as already picked quantities and pricing. Fruit shares are still available for purchase if you decide you’d like one to go along with your veggie share. Fruit shares this week will receive the following: our certified organic, flash frozen orange juice, plus 3 quarts already picked organic strawberries, or 6 quarts if you pick your own. Fruit shares will be ready for pickup from 3:30-6:30 pm on Tuesday and Thursday. Please come on the day you selected on the registration form. No early birds please! Parking for fruit share check in is available along the edges of the driveway, please drive slowly and watch for children. The strawberries loved the heat and sun these past few days! They look wonderful. You will have the option to pick your own 6 quarts on your pickup day. You may pick more than 6 quarts if you wish, at the reduced price of $2.10/lb. Children are welcome to pick as well, with adult supervision. Please take care not to step on any overhanging strawberries in the rows, and to stay in the rows that Lisa directs you to. Regardless of whether you choose to pick, please check in at the fruit share stand (to the right of the store if you’re facing the store). Your juice will be available at the check-in point, as well as already picked berries if you don’t choose to pick. The u-pick field is located down the gravel driveway behind our store. The driveway forks left once you near the tree line, take the left turn and you’ll come to a hill. Drive slowly down the hill, and go to the right. Once you go right, you’ll see a white tent at the other end of the field. Drive to the tent and you’ll see a grassy area for parking. Lisa will be under the tent, so check in with her first and she’ll direct you to the rows you may pick in. Lisa will have quart baskets and flats available for purchase if you need any. Traffic in the field will be counter-clockwise so when you leave, don’t drive out on the side of the field that you came in on. There will be signs to alleviate any confusion! Please drive slowly and use caution as the driveway is narrow and there may be a fair amount of traffic! Also, watch out for children! Please e-mail us to let us know if you plan to pick your own or get already picked berries, and mention which day is your chosen pickup day. This will help us ensure that we have enough berries picked! If you'd like to bring your own containers/basket to empty already picked berries into, we'd appreciate it. Strawberries freeze well, should you find yourself with more than you can eat right away! Simply remove the stem end, (rinse if you desire, although they’re certified organic so we only rinse if they’re sandy/muddy) and place on a baking sheet in the freezer. Once they’re frozen solid, transfer them to a ziplock bag or container of your choice. If you’re feeling lazy, you can simply freeze them without the baking sheet step, although they tend to stick together once frozen which can be annoying. Hello all! We are so excited to begin another year of offering organic vegetables and fruit for all of you. The strawberry and blueberry crops look terrific this year! In our new (1st year bearing) strawberry field, which is behind the stand in a lower field, the berries look like they could be the best we've ever had. There is no obnoxious wild parsley, and almost no weeds at all, due to a LOT of diligent weeding by our crew! We planted a lot more strawberry acreage than usual last year to be ready for this year, and our family and determined crew cared for it all last year with great results. If you like organic strawberries, this is the year to replenish your jam and smoothie stock. We will also have organic sugar for sale, and hopefully pectin supplies too. We are guessing we will be able to pick the first few berries somewhere around June 9th for the stand, then we may have enough berries to start fruit shares the following week. If so, the first fruit share pickups would be June 13th and June 15th, depending on if you chose Tuesday or Thursday as your pickup day. If you can’t remember which day you chose, please call or email us and we’ll check for you. Please watch your email for a confirmation of these dates, and more info, because the weather within the next week or so will impact fruit share start dates. The first official newsletter will contain more info about pickups, so if you’re a first-timer, stay tuned for more details to come soon! This week we have loads of our organic asparagus, and anyone in our vegetable CSA can get it at the super discounted price of $3.00/lb. If you only have a fruit share, you may still purchase asparagus! Please call 716-655-4486 or email thorpesfarm@verizon.net if you’d like to order more than 5 lbs. of asparagus. We are not sure yet when vegetable share pick up will start. Things are growing great, and we are on schedule with spring planting, but the initially wet spring means vegetable shares will most likely start one week after fruit shares (see above info for fruit share details) due to strawberries being ready before most of the veggies. No worries, you’ll still get 21 weeks of vegetables in total! More info on share pickups will be sent out closer to the start date, and we will post the information on our website as well. We try to stay active on our Facebook and Instagram accounts, so follow them if you’d like frequent fruit and veggie updates! Our best guess is that vegetables shares will begin June 20th and 22nd depending on which pickup day you chose, but stay tuned to your emails for date confirmations. This week we have loads of our organic asparagus, and anyone in our vegetable CSA can get it at the super discounted price of $3.00/lb. Just please call 716-655-4486 to order it so we can have it ready for you. Asparagus is here! This year's crop is about two weeks earlier than last year's, which is pretty exciting. The prices are as follows: $3.60/lb. for vegetable share members, $4.50/lb. for everyone else. We'll have asparagus available in the store daily on a first come, first served basis. If you'd like to place an order and have some set aside for you, just call or e-mail us with the number of lbs. you would like, your name and phone number, and the date/time you would like to pick it up. We will call if we cannot fill your order at that time. Farm store hours are from 9:00am - 5:00 pm Monday-Wednesday, Thursday & Friday 9:00 am-6:00 pm, Sat. 9:00am - 5:00 pm and Closed on Sunday. After hours the stand will be set up self-serve, subject to supply. The office is not open on the weekend to take orders, but you can purchase asparagus at the store. We hope you're as excited as we are for the upcoming growing season!